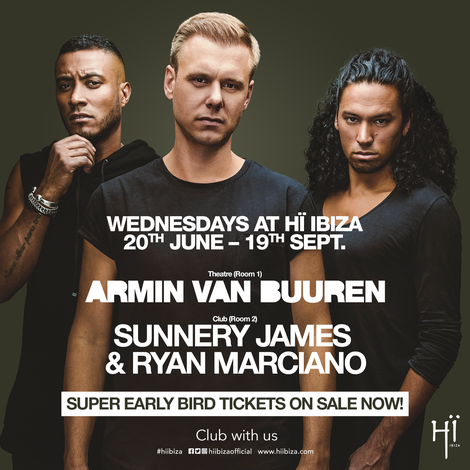 Armin van Buuren and Sunnery James & Ryan Marciano will return to Hï Ibiza this summer, taking over Wednesdays from 20 June to 19 September. Since opening its doors for the very first time in 2017, Hï Ibiza has played host to many of the biggest names on the electronic music scene, welcoming thousands of party revellers from all around the world, all eager to experience the island’s latest nightlife institution. With big name residents, state-of-the-art design and sound and a commitment to putting the clubber at the centre of the experience, the groundbreaking club has apparently proved itself a force to be reckoned with. Recently it revealed that one of last year’s most popular residencies will make a return in 2018, with Armin van Buuren taking control of the Theatre each and every Wednesday from 20 June to 19 September. Having apparently packed out the club all of last summer with sets that took the dancefloor on a full speed journey encapsulating the genre’s past, present and future, Armin makes a welcome return to the White Isle. In the Club (Room 2), Amsterdam’s Sunnery James & Ryan Marciano also make a return bringing their blend of dance music to keep the crowd entertained all night long.